Follow these before, during, and after instructions to keep your family safe in the event of a Wildfire. 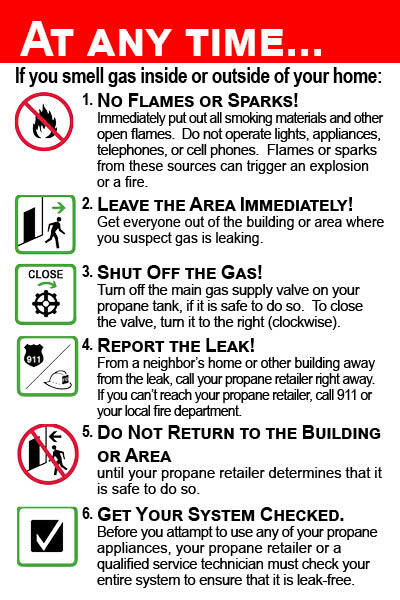 Know how and where to shut off the outdoor propane supply and indoor propane appliances. For more information, contact your propane retailer. Clear at least a 10-foot area around your propane tank and gas grill of any debris. Remove anything that is combustible or easily ignited, including leaves, brush, any vegetation, and rags. Make sure the grill and all propane cylinders are at least 10 feet from any structure. Have an adequate supply of propane in your tank. During and after a wildfire, propane and other types of fuel may not be readily available and roads leading to your home or farm might not be accessible for delivery. MAKE SURE THAT YOU AND YOUR FAMILY KNOW WHAT PROPANE SMELLS LIKE. Propane has a strong, unpleasant smell like rotten eggs, a skunk’s spray, or a dead animal. It is recommended that you consider installing a carbon monoxide (CO) detector listed by Underwriters Laboratories (UL) on every level of your home. Be sure to follow the manufacturer’s instructions regarding installation, location, and maintenance. Propane gas detectors provide an additional measure of security. It is recommended that you consider installing one or more propane gas detectors listed by UL. Be sure to follow the manufacturer’s instructions regarding installation, location, and maintenance. Have a list of instructions on how to turn off electricity, propane, and water. Review suggested preparations for natural disasters such as wildfires with your propane retailer as well as other utility suppliers. Advise them of any special needs you may have. Create an emergency preparedness plan and review it regularly with your family in order to keep them safe during a potential disaster. Wildfires can spread quickly and destroy or damage homes and property, including propane tanks and appliances. In addition to the intense heat and flames of a wildfire, fallen trees and power lines can present major problems for homeowners and emergency responders. Often, they block access routes for fire trucks and other emergency vehicles. If a wildfire threatens your safety, you may have to decide whether or not it is necessary to evacuate your home or farm. Listen to your local authorities, or television and radio stations, for instructions on the appropriate course of action to take. Whether it is determined that you should stay or leave, you should shut off your gas. Turn off the main gas supply valve on your propane tank, if it is safe to do so. To close the valve, turn it to the right (clockwise). Turn off the gas supply valves located near individual indoor appliances. Consult your propane retailer to make sure you now where the actual valves are located and how to shut them off. If you have a propane fireplace or log set, close any screen, door, or damper. If your gas comes from a metered pipe system, consult your propane retailer on how to shut off the gas. Use extreme caution when returning to your home or farm. If you have any doubts about your safety, leave the area immediately and have your property inspected by a qualified building inspector or structural engineer before re-entering. When you have determined that it is safe to return, take the time to carefully evaluate the condition of all the structures on your property. If it is dark, use flashlights, not candles. Look carefully around the entire area. Check for downed power lines; they can create major safety hazards. Inspect your gas lines and tank for damage. Immediately call your local utility company or propane retailer if any of these hazards are observed. outdoor portable heaters, barbecue grills, and portable generators. Only use appliances indoors that are designed and approved for indoor use. NEVER turn on a light switch, use any power source, or inspect your household appliances while standing in water. This can result in electrocution. DO inspect chimneys, flue pipes, and vent connectors for damage, blockage, or debris. DO inspect your propane appliances for water or other damage, if it is safe to do so. If the appliances have electric components and have been exposed to water, they can create a fire hazard. DO schedule a time for a qualified service technician to perform a complete inspection of your propane system. The technician can also perform a leak test on the system and re-light your pilot lights. DO NOT use or operate appliances, equipment, or vehicles, or turn on the gas supply, until your system has been inspected by a qualified service technician.